My boys like to tug - but they love to retrieve, I've found it hard to find toys that work for both. Soft tug toys get saturated with spit and pickup dirt and sand. I can't (won't) use fleece tugs when we're working in the barn and they're pretty lousy toss and retrieve toys. I kept looking at toys made from used (discarded) udder inflations**, but most of those toys came with fleece parts. **Udder inflations are the liners of automatic milking machines. Soft and pliable, they attach to the udders of dairy cows. Used ones carry a moderately strong cow scent - even after several washings. Dogs love them. If you have friends or neighbors in the dairy farm business you just might find a good source for all things udder. I found a vendor at a dog show recently who was selling the very pretty fleece and udder tugs, but also the just the inflations out of a bucket for $1.50 each. What a bargain! I stopped at the hardware store to shop rope and decided on 100' of poly rope. 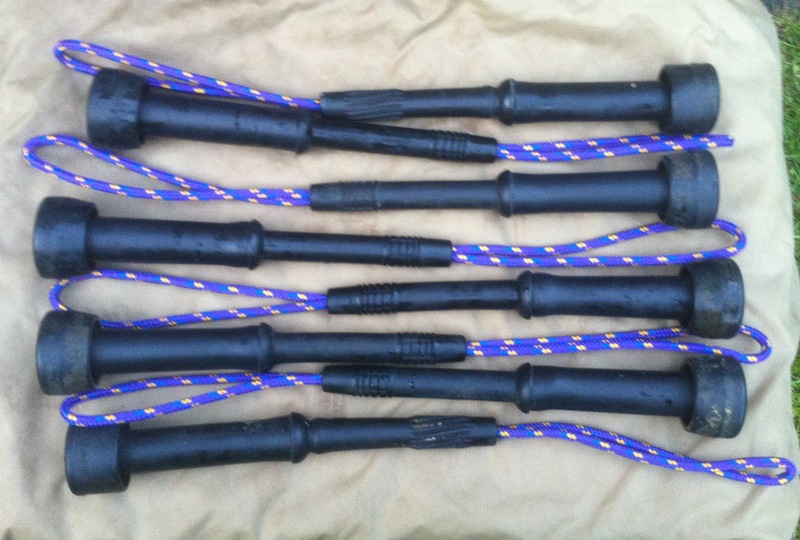 Be sure to choose poly or cotton rope - nylon rope would hurt - a lot as it broke down and splintered. I started with four inflations and went back to buy another five. At a cost per unit of under $3 they're now the toys that I take to the park. If we loose one, or another dog steals our toy we'll just bring another one next time. It took me a few tries to decide the easiest way to get the rope through the inflation and then what I actually wanted. 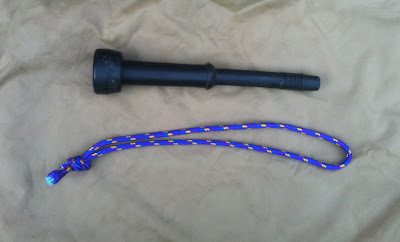 I made one braided handle udder toy - which took me a while to get just so. 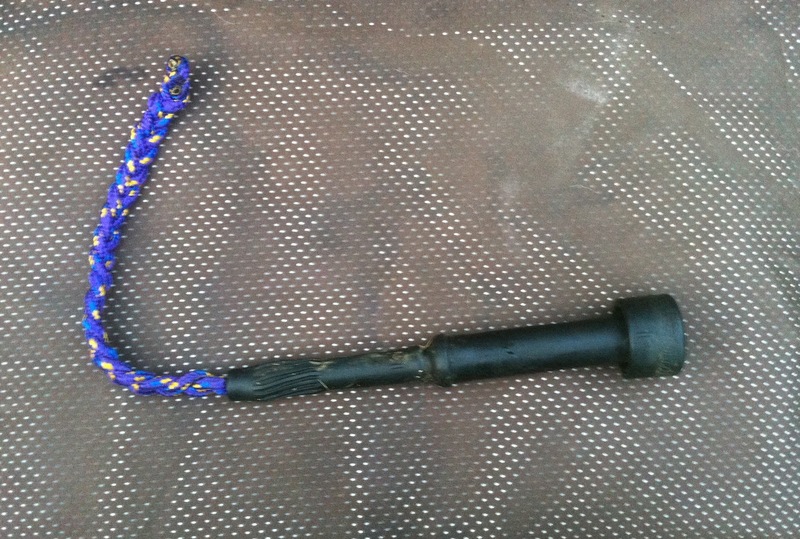 With the poly rope you have to seal (melt) the ends with flame to keep the rope from unraveling. This was easy enough to do, but the end product was not quite what I was looking for. I ended up with a very simple design - easy to make, throws easily (and far) and seems to hold up to tugging as well. In addition to the inflation and the rope you'll need some picture wire (the stuff used to hang art on walls). 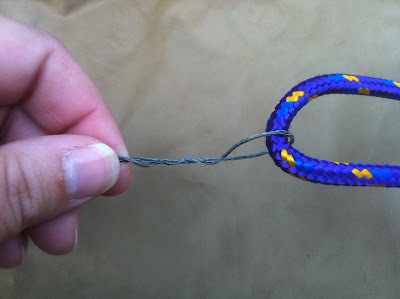 I tried dental floss and a length of twine, nothing worked as well as the picture wire. Udder Inflation, Rope and picture wire. I cut a length of rope approximately three times the length of the inflation and made a simple knot at the end. 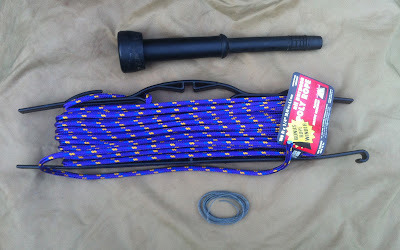 Fish the wire through the the handle and pull through the inflation. About 20 minutes later I've got eight udder-toys ready for action! For those wishing for a fleece model check out the Fludder toys at Fluggles.